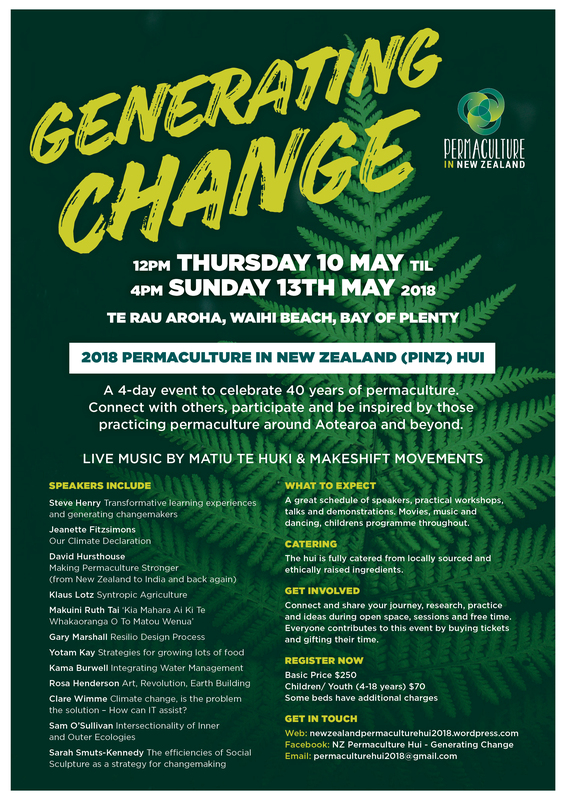 GENERATING CHANGE This collaborative event is the annual celebration of Permaculture goodness from all around Aotearoa. This collaborative event is the annual celebration of Permaculture goodness from all around Aotearoa. The National Hui offers significant space for co-creation, and we invite you to participate in this, bring anything you may have to offer your community – be it your skills, insight, wisdom, music, activities and/or presentations. We are all volunteers so get involved! Please check out our facebook event, website or contact us. We would love to talk to you. We look forward to meeting all of the wonderful participants and exploring what emerges when we all get together again in one place. Check out our confirmed presenters here. We have a great rate for children and a special programme for them so bring the whole family along! The children’s coordinator is Mela Herbert, from Taupo. The event is fully catered with great food, sourced from local, organic farms and cooked with skill and love by Charlotte Pearsall. Permaculture in New Zealand Inc. utilises a payment page hosted by a certified PCI DSS compliant service provider. Cardholders are redirected to the payment page to enter their credit card details. Permaculture in New Zealand Inc. is a registered charity.